“Made with grapes from the vineyards lying nearest to the winery. Compared to the original version it has a small additional presence of Syrah. The Rocca di Frassinello project was inspired by a very simple idea – or should we say a very simple need: to replicate the model of excellence set in motion by the Castellare di Castellina winery in a new region. We set our sights on the central Maremma area, between Bolgheri and Scansano, where a sort of geological foot can be found, with the same characteristics as the Chianti and Montalcino terrains (of which this foot is in fact a kind of extension towards the sea). Land, therefore, similar to Tuscany’s most famous wine regions, but with one important difference: an average temperature 4 to 5 and even 6 °C higher, with grapes therefore characterised by the ability to ripen even three to four weeks earlier.. 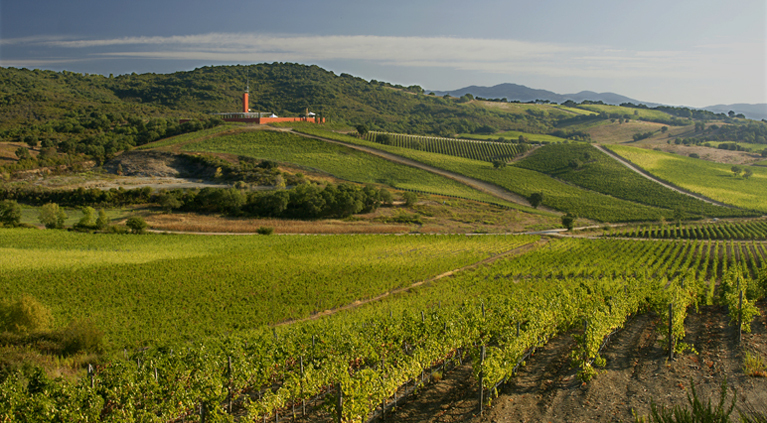 This area, so incredibly well suited for cultivating grapes is part of the Gavorrano and Roccastrada municipalities. It is indeed here where the first – and so far only one of its kind – French-Italian joint venture project for the production of wine took shape. 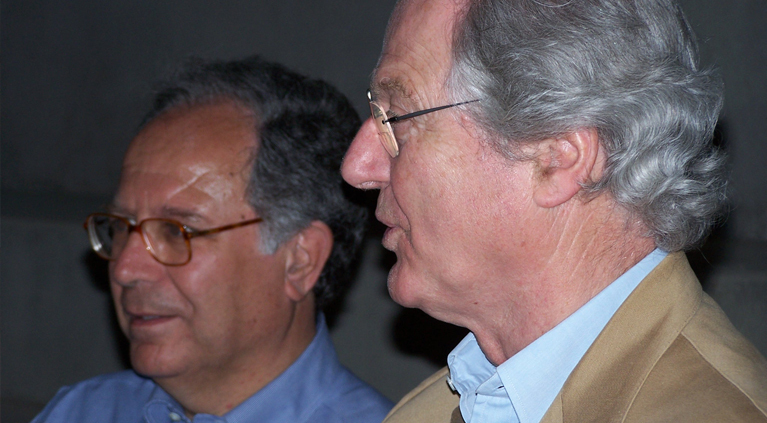 The agreement between Castellare and Domaines Barons de Rothschild (Lafite), leading French wine brand in the world, aimed from the very beginning to bring together the experience of Castellare in the cultivation and vinification of Tuscany’s main vine variety, the famous Sangioveto, with Lafite’s long standing know-how of classical French vines like Cabernet, Merlot, Petit Verdot and Shiraz. It took two years to bring together the five small farms that make up the 500 hectares of the Rocca di Frassinello, a continuing project which today already sees close to 90 hectares of planted vineyards. 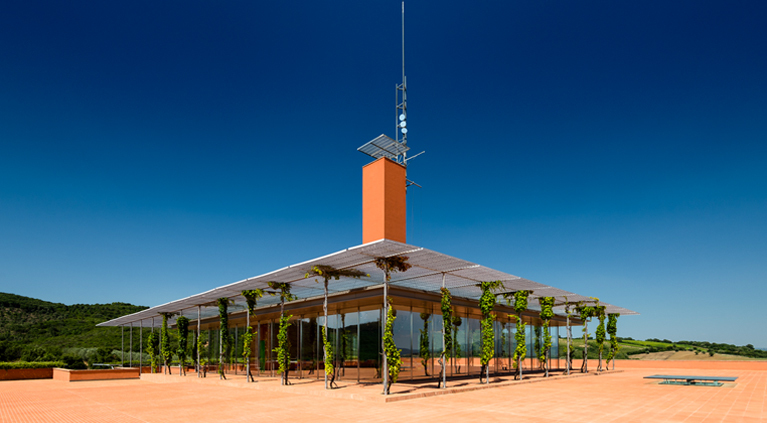 This already extremely ambitious venture has been further enriched by marking and pairing the birth of the Rocca di Frassinello winery with one of the most prestigious names in the world of design and architecture: that of Renzo Piano. (nella foto a sinistra). Rocca di Frassinello lies on the right hillside heading north that forms on either side of the old Aurelia road and which, thanks to the first major Roman road, forms a sort of canyon through which the sea wind blowing from the plain between Castiglione della Pescaia and Grosseto travels across. This constant breeze takes away any moisture from the air and provides for an even milder climate, both during the winter and summer months. The tallest hill in the area is situated right in front of the village of Giuncarico, on the right side of the Aurelia heading north. 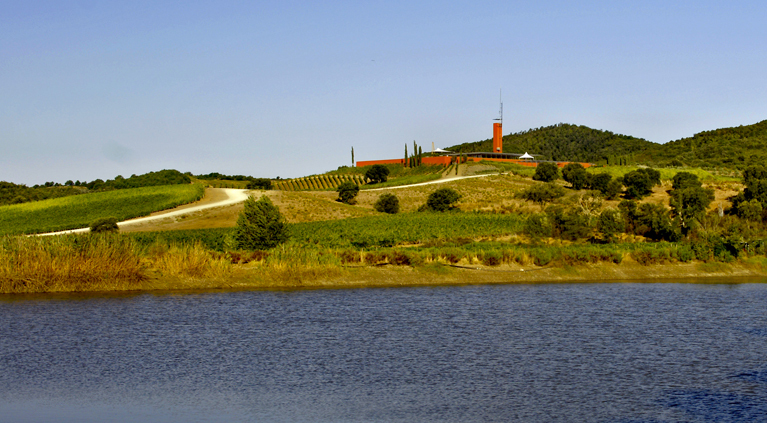 The top of that hill, which is part of the Terminuzzo estate, offers a spectacular sea view over Marina di Grosseto, all the way to the Uccellina Regional Park. Having taken shape thanks to an Italian-French joint venture, the nearly 90 hectares of vineyards are characterised by equally divided varieties: 50% Italian and 50% French, while all wines are blends, excluding the Baffonero which, in the spirit of the America's Cup, serves as a challenger to Masseto, (100% Merlot), the most famous Italian wine produced by our friends, the Marchesi Frescobaldi family, owners of the Ornellaia estate. A complete opposite to the Castellare di Castellina philosophy, characterised by vines that are not blended with international ones. The first vintage was produced in 2004 and included approximately 130,000 official bottles. Rocca di Frassinello chose Renzo Piano, just as Renzo Piano, in turn, chose Rocca di Frassinello. The motivation is rooted in the longstanding friendship that binds the famous architect to Paolo Panerai, as well as in the family legacy of a father who was a wine producer, particularly of Dolcetto. 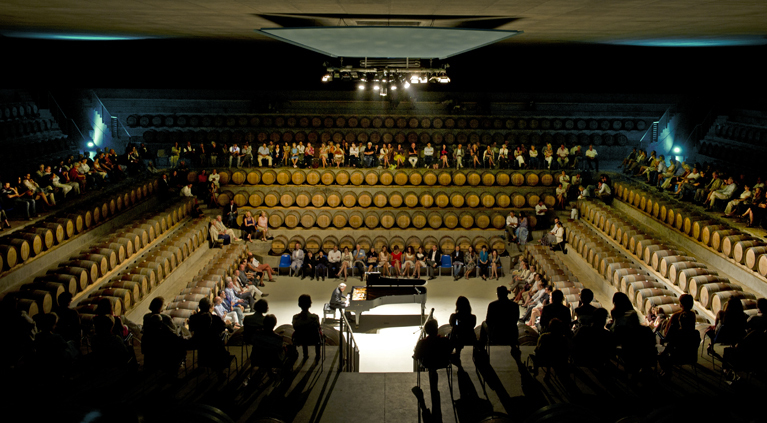 Renzo Piano has designed a cellar essential in terms of its shape and conceived not to serve as a monument to the customer or to the wine, but rather to enhance the functionality of what it represents: remaining a place where productive work unfolds – work of a specific, ritual, almost sacral nature – yet at the same time humble. Typically, wineries are characterised by a progressive and horizontal development of the premises to follow the production cycle: from the vat cellar to the barrel room and finishing up in the storehouse. 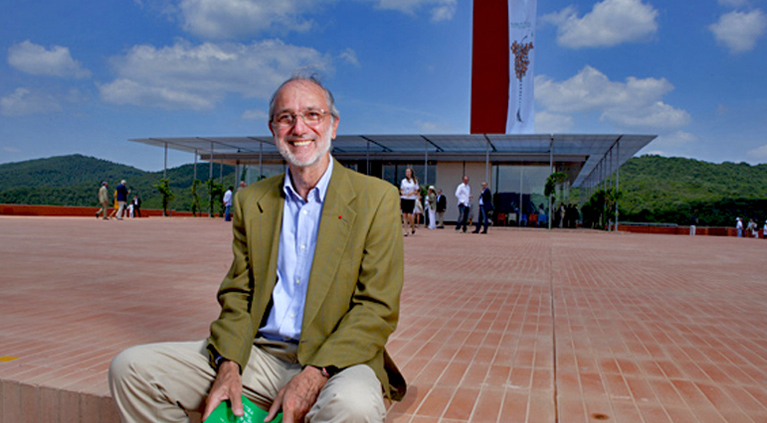 Renzo Piano has revolutionised this concept of space, posing the question of what really is the heart of a wine cellar. There, where the wine ages, remaining in barrels or bottles, where its quality improves. The answer: the barrel room set in a central underground position, making it possible to naturally maintain a stable humidity and temperature. An imposing 40 by 40 square metre space, with an enormous floor slab that stands without being supported by any columns. All around, like a 20-metre frame, the distribution of all aspects of the production cycle unfolds. The steel tanks are distributed on two sides of the area and above each one stands a chute that opens onto the roof above. The roof of the barrique in fact serves a dual purpose as the large work area created above – the churchyard as Renzo Piano calls it – while from those chutes come down the grapes carried in crates, which before descending without the stress of pumps are carefully selected on special work benches. All other production functions are distributed along the other two sides: bottling, storage, warehousing and logistics. "Rocca di Frassinello, like all "fortresses", aspires to resist against something – perhaps in this case banality. Frassinello conveys the idea of the modern world composed of countless bridges between past and future, Renzo Piano vs. the Etruscans, the Etruscans vs. Paolo. 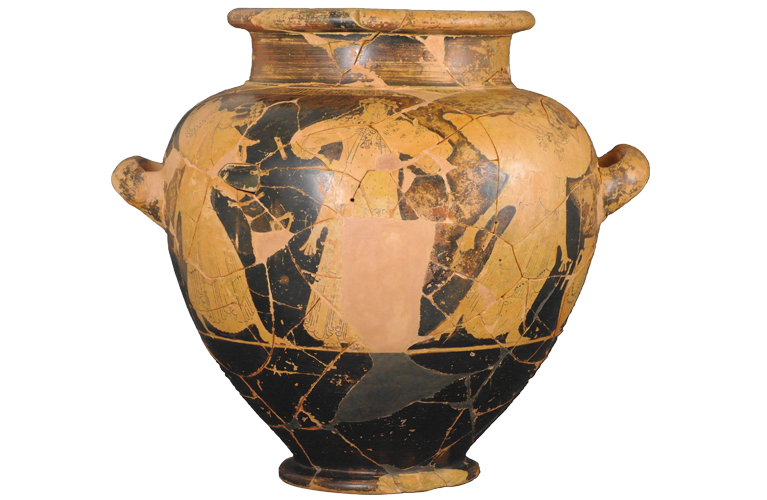 Offering a future to Frassinello’s past, the Etruscans gave us this beautiful vase depicting Dionysus, for the festivities to begin!" Our guests can spend a few hours exploring the multi-faceted identity of the Rocca di Frassinello: a journey that begins discovering Renzo Piano’s revolutionary architecture, to then explore the Etruscan Exhibition designed by Italo Rota, gaining a deeper understanding of the magical art of making wine and its ancient roots which, in this area, date back to almost three millennia ago. The tour concludes with a wine tasting, livened by the opportunity to admire David LaChapelle’s work Rapture of the Grape of Rocca di Frassinello, which the great American photographer and artist created inspired by the estate’s wines and surrounding landscape. You can purchase our products directly at the Rocca di Frassinello winery year-round, with the exception of January 1 and December 25. Classic Tour: Tour of the winery and of the “Etruscans and wine at the Rocca di Frassinello” exhibition, with tasting of 4 wines. Available at a price of 25€ per person, with a maximum of 15 visitors per tour. Superior Tour: Private tour of the winery and of the “Etruscans and wine at the Rocca di Frassinello” exhibition, with tasting of 5 wines in our technical room, accompanied by tastings of local cold cuts and cheeses. Available at a price of 50€ per person. Receive our newsletter, you will be informed about events, awards, offers and more other.